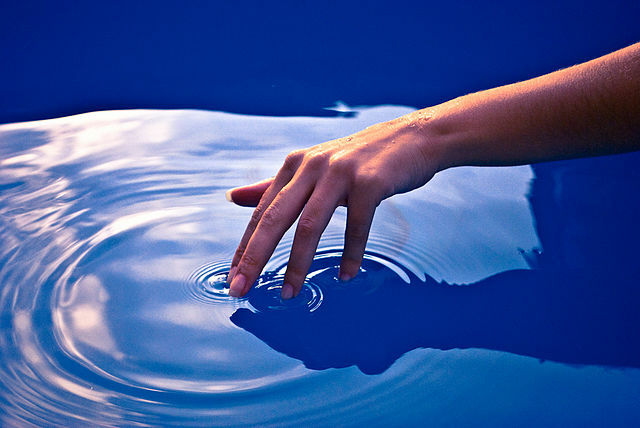 The ripple effect of what we do is sometimes only clear with hindsight which may not always have 20-20 vision. Many bad choices can be prevented by thinking through our actions – ok Coach…that’s kinda obvious. Why then is it that there are so many things people, even the smartest or most regarded of us, do that end with the person saying “I just didn’t think…” or “I didn’t realise…”. 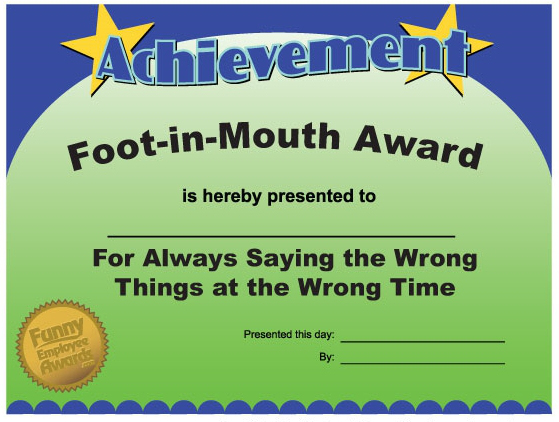 Tim Mathieson suffered from foot in mouth the other day in something that a number of people found embarrassing, amusing, shocking but worst…offensive. As an ambassador for men’s health, his heart may have been in the right place – getting men to laugh and be comfortable with getting prostate checks. His execution and his position as the partner of the Prime Minister of Australia resulted in the wrong kind of attention to an important issue. In writing his speech, I wonder if he’d planned to use that quip or whether it was a spur of the moment remark? Recently I read in my Professor’s blog how he and his son had picked up a quote from Lance Armstrong while watching the Road to Paris during a break from slalom canoeing. They used this as a mantra for their training – now, nearly 12 years on, they know the source of the mantra they’d used was a liar and a cheat. There are so many obvious victims of the lies and bullying perpetrated by Lance Armstrong, but in all that time and in the aftermath now, do you think he has stopped to think of how far and wide his lies have reached? How so many people not even related to his sport believed in him and had hope because of what he achieved. As a cancer survivor I have no doubt there are people out there fighting for their life who believed in Lance and now whose mental strength has been shaken which will make real impacts on their recovery. Getting back to my original thought though, mind mapping can be a lot of fun and can help with making tough decisions. When you know why you are making a choice, it becomes so much easier to make that decision to study or the decision to travel or even just the decision to take out the garbage! I haven’t done a mind map in a while but I found myself drawing one yesterday at work while my cohorts and I were doing some initial brainstorming on a task we’ve been set. As I doodled our thoughts, it reminded me of a brilliant mindmapper I met at the Day of Inspiration in Sydney last year. 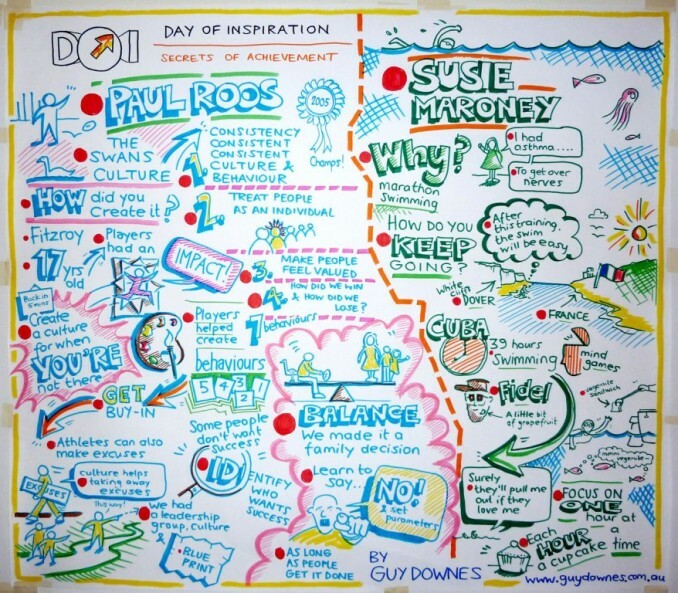 Guy Downes mapped the presentations given by each of the keynote speakers for which I was not only fascinated by all day long, I was jealous too – I wish I could draw! One of the boards from the day is pictured below. These are much more elaborate than my maps. Mine are often just circles with interconnecting lines, but they have helped me make some key decisions and stick to them. Once you start doing them, they then help you think outside the square and then make more considered and/or informed decisions and sometimes at a lightening pace. 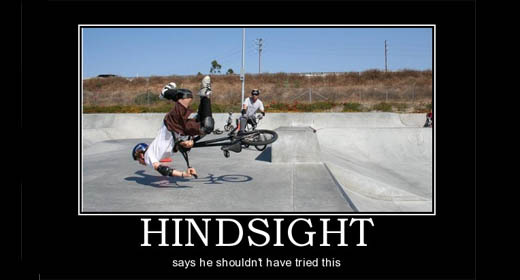 Last weekend I was officiating a triathlon and came across an athlete who had fallen very badly on the bike course. I guarantee I wasn’t doing a mind map to decide what steps to take, but the thought process was the same. All of the thoughts that came into my head slipped quickly into an ordered pattern, I was able to sort important thoughts from useless info and I feel that I responded well in that situation. Our choices are something we have control over. Mind mapping is one of many ways to make a choice that I use, pro’s and con’s are another. Choosing to practice mind mapping might lead to making better choices – will you choose to give it a go? Do an internet search on mind map and you’ll find plenty of free software to do digital maps (I do most of mine by hand). There are also plenty of sites that will walk you through where to start and how to map your thoughts.